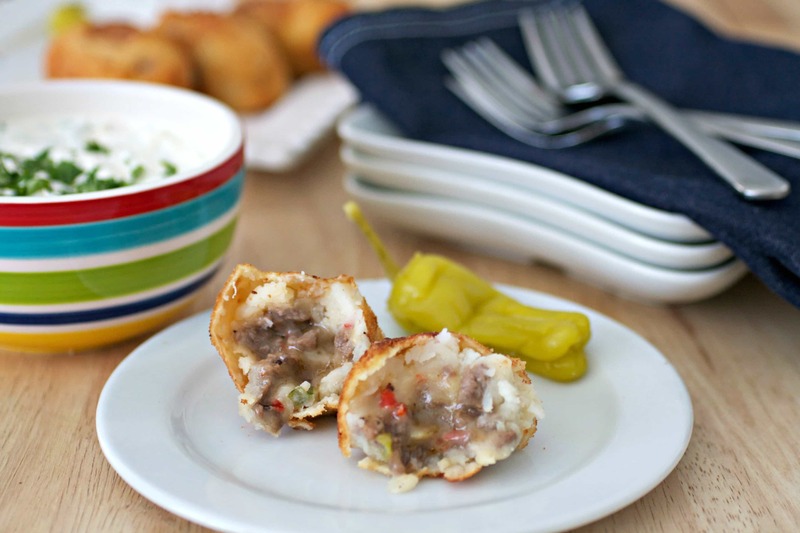 Crispy Cheesesteak Potato Croquettes are filled with a mixture of top round, red bell peppers, and onions and served with a homemade pepperoncini ranch dip. Perfect as a game day appetizer or as a party finger food. Can be made ahead of time and frozen until ready to use! 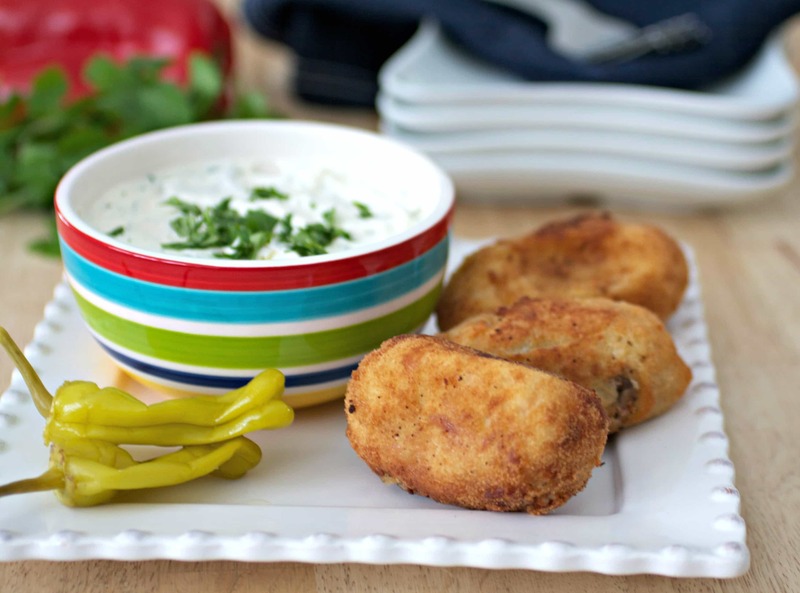 In honor of the most important news story in the United States right now, the Deflategate scandal (sarcasm intended), I’ve made these Cheesesteak Football Potato Croquettes (and added a tasty homemade ranch dip). For those people who don’t follow football or the news, “Deflategate” is what the media has termed the controversy surrounding allegations that the New England Patriots deflated their footballs during the AFC Championship game against the Indianapolis Colts. 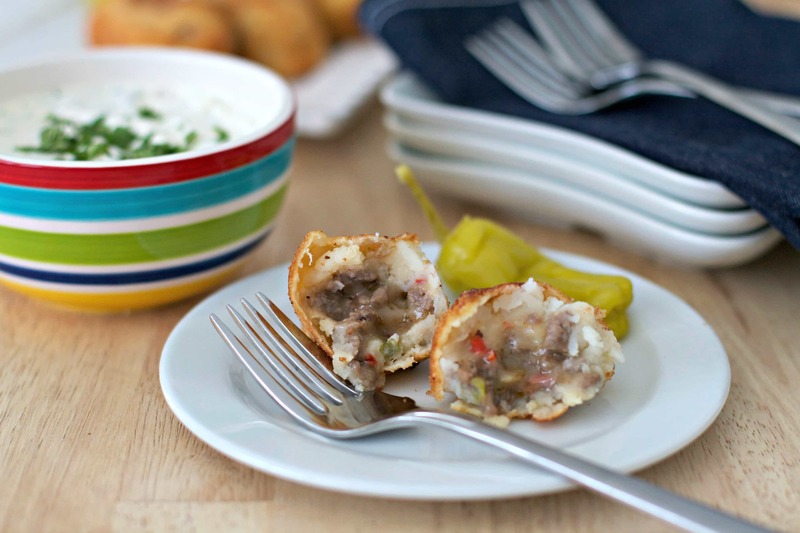 The perfect game day appetizer for the best football games around! After watching the ridiculous amount of media coverage on this even more ridiculous topic, I decided something more positive had to be done about it all. I took the next logical step possible and made some cheesesteak potato coquettes shaped like footballs (okay, I tried to shape them like footballs and paired them with a fantastic pepperoncini ranch dip. 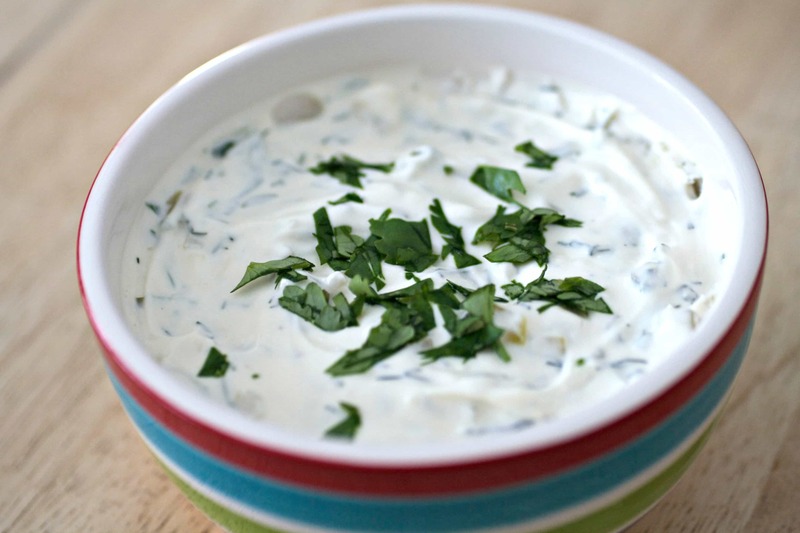 This ranch dip is so good, you’ll want to use it for a salad dressing too! 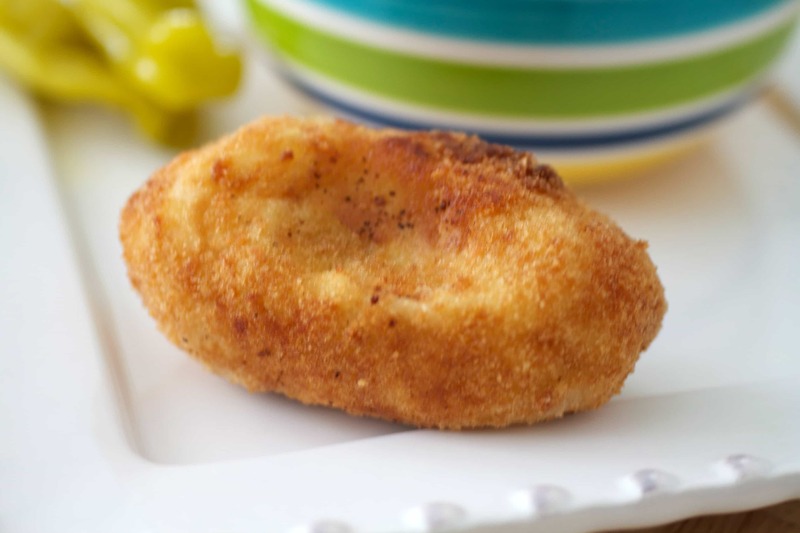 There is a Cuban version of potato croquettes called papas rellenas and they are little fried mashed potato balls filled with picadillo. I make papas rellenas at home all the time, so when I was thinking up some good Super Bowl recipes, I thought a cheesesteak filling would be the perfect mixture for a mashed potato wrapper. 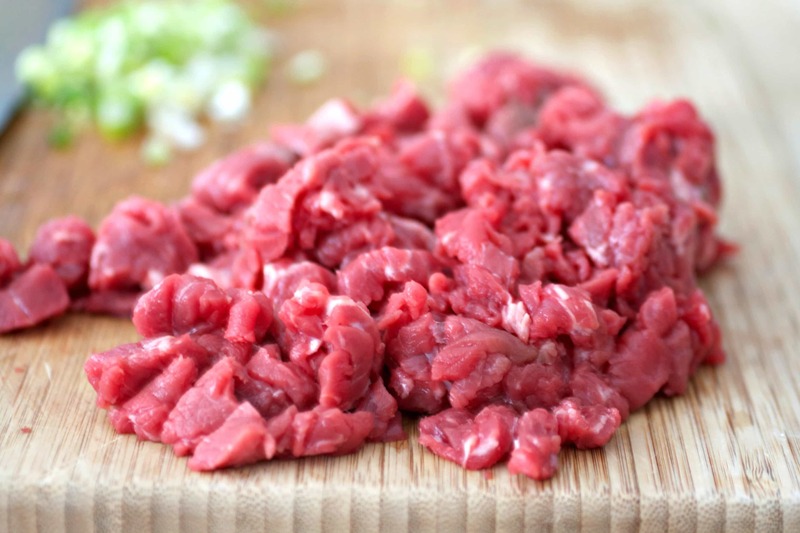 Use a sharp Chefs knife to cut the beef in 1/8″ slices, against the grain, and then cut those slices into small cubes. 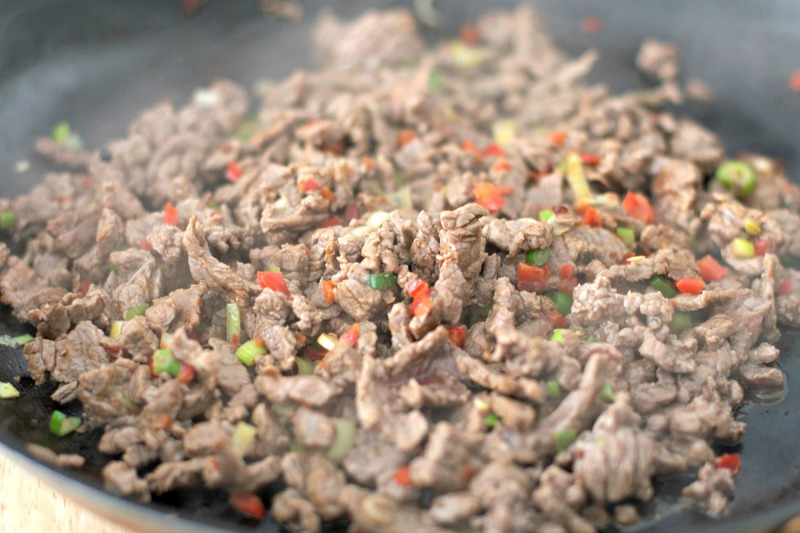 Brown the beef cubes with minced red bell peppers and green onion, then mix in the cheese at the end. Let cool and put a spoonful of the cooked filling on a round mashed potato patty. Fold over the potato patty, encasing the filling inside. Roll each one in the beaten eggs, then the flour, then back in the eggs, then the breadcrumbs. Place on a tray in the refrigerator or freezer for at least 2 hours to firm up before frying. ***At this point, the potato croquettes can be made ahead and frozen for later use. No need to thaw when ready to use, just fry them frozen! YAY!! All that melted cheese mixed in with the steak and vegs encased in a potato pillow is absolute heaven! The pictures may not look pretty, but they were sooooo good. Literally, I almost ate all of them before the photo shoot. This mixture would be so delish piled high inside a soft yeasty roll too, just like a traditional cheesesteak. Whenever I munch on a cheesesteak, I add a ton of pepperoncini peppers on top of it. I love these pickled mild Italian peppers so much, it was a very easy decision to add them to the homemade ranch dip. Super pleased it turned out so well, especially since I don’t even like ranch dip! 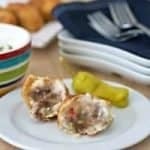 Hope you make these Cheesesteak Football Croquettes and Pepperoncini Ranch Dip for your next party and please let me know in the comments how you liked them! Place potato chunks in large pot, cover with water, and boil over high heat until fork tender, about 15-20 minutes, until tender. Drain potatoes and mash in the pot until no more lumps. DO NOT add any butter, but can add 1-2 teaspoons milk or half & half to smooth it out. Add salt and pepper to taste, then set aside and let cool. In a large skillet over medium high heat, add 1 teaspoons of olive oil with the minced red bell peppers and onions. Cook for 3 minutes, or until lightly browned. Add the remaining 1 teaspoon olive oil and steak to mixture. Cook for another 3 minutes, or until the steak is just cooked through. Remove from heat and add cheese. Mix well until cheese is melted and fully combined with the steak and veggie mixture. Add salt and pepper to taste. Set aside and let cool. 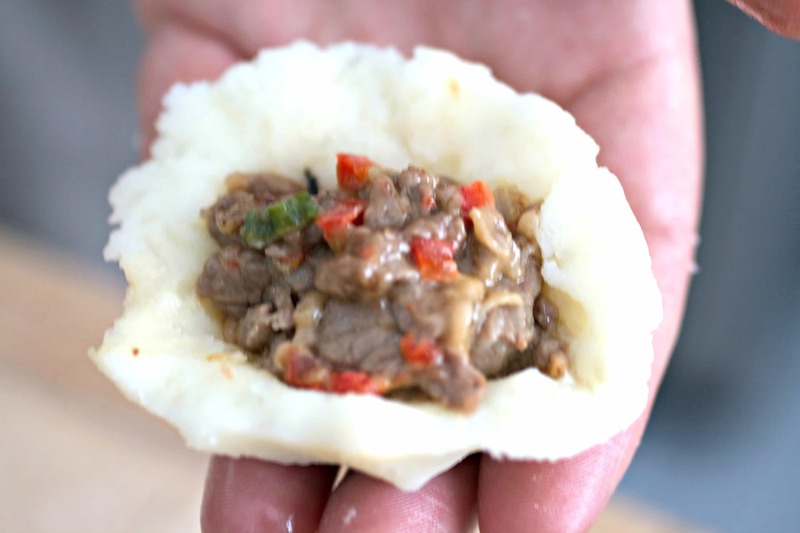 After both potato and cheesesteak mixtures have cooled, place a spoonful of the mashed potato mixture in your hand and shape into desired ball size, then flatten into round patty, take spoonful of cheesesteak mixture and place in middle of patty. Fold up patty sides and seal around cheesesteak mixture, fully encasing in, and shape into oblong football shape. Set aside and repeat until croquettes are formed. Set up a dredging station with the flour in one shallow bowl, breadcrumbs in another bowl, and beaten eggs in third bowl. Take each croquette and dip in the beaten egg, then the flour, then back in the egg, then in the breadcrumbs. Place on a tray and repeat with all remaining croquettes. Place tray in the refrigerator or freezer for at least 2 hours, until croquettes have firmed up enough before frying. To fry, place enough vegetable oil in large fry pot to fully cover the croquettes. Heat oil to 350F degrees, place a few chilled or frozen croquettes in hot oil and fry until browned on outside. Drain on paper towels or on a wire rack. Finish frying the remaining croquettes. Serve with pepperoncini ranch dip or your favorite dipping sauce. Mix all ingredients together in a medium bowl. Cover and place in refrigerator for at least 2 hours for the flavors to meld together. Store leftovers in a tightly covered container in the refrigerator for up to 1 week. Serving size is 4 croquettes. Croquettes can be frozen after assembly. 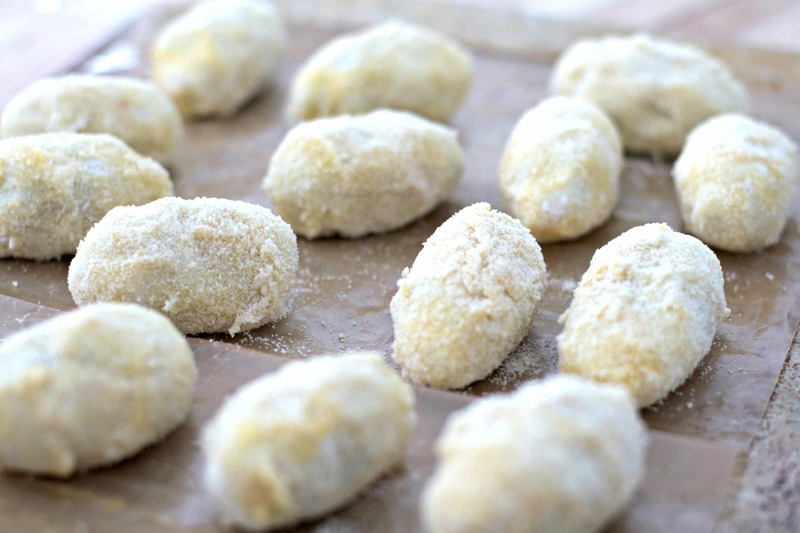 Freeze the croquettes individually on a baking sheet and place in a freezer proof bag or container. Keep frozen for up to 3 months. These look exactly like the deflated balls! Love that we are both stuffing things for the love of all things Super Bowl. These look delish keep up the great, yummy work!! P.s. these DO look like footballs! Thanks so much Cheyanne & you know, great minds think alike. We should do a joint post of appetizer recipes to serve at next year’s Super Bowl party. What is the serving size? Are the nutritional facts for one croquette? Looks delicious! Hi Kayla and thank you! The serving size is 4 croquettes.